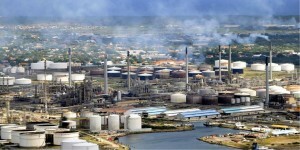 WILLEMSTAD - Employees who in the future are working at the oil refinery Isla through a contractor or subcontractor will earn the same as their colleagues who are employed at the refinery. This was agreed upon in the Memorandum of Understanding (MoU) with the Chinese company Guandong Zhenrong. This was announced by the Prime Minister of Curaçao Dr. Bernhard Whiteman in a nationally televised discourse yesterday evening. The Prime Minister also stressed that the signing of the MoU is to the advantage of the island. Whiteman stressed that there will be no Chinese employees in the refinery. This means that the local workers must be trained to be able to work with the new machines and installations when the refinery is modernized. About 4,000 new employees will be needed to satisfy the demands of the modernized refinery. According to Whiteman, this is good for pensions and health insurance. The investment of 10 billion dollars by the Chinese company in the refinery will also benefit the environment.